Grassroots Trust was set up to help shape a viable future- we were aware that, while our country has enjoyed a remarkable period of growth, the foundations for a sustainable economy are weak. Like many countries in the developing world Zambia has relied heavily on finite resources like copper, unsustainable harvest of natural capital, investment inflows and donor aid to achieve growth. Production from renewable resources is declining steadily. Average crop yields have declined to a quarter of what they were in the early 1970’s, livestock numbers have fallen drastically and natural capital including fish, wildlife and forests have been decimated with little corresponding rise in quality of life for the majority of people. As biodiversity is lost, soils lose their fertility and their ability to accept and hold water, growth is undermined and the whole environment shifts towards desert. Developing countries must explore a more holistic development trajectory- we cannot simply follow in the footsteps of powerful developed countries which have focused on social and economic development strategies and hope this will produce sustainable growth. It has taken vast resources from all over the planet to create wealth for a relatively small sector in developed societies, very often at the expense of the global majority and with massive damage to the environment. “One can’t see the wood for the trees” the English say, meaning we can’t see clearly because we are too closely involved. A key mentor and champion of modern Holistic Management, Allan Savory urges us to begin by zooming out, stepping back for a moment and see if there are patterns and trends that may help us guide us to make better choices, sound decisions for the future. He coined a new word for zooming out called Holistic Context. A fast increasing human population across much of the world, combined with rapidly rising consumption rates is rapidly depleting many key finite resources: it seems urgent that planners need to base future economies on renewable and regenerating resources. Throughout history we have pitted our wits to harvest nature’s abundance more efficiently; now economies need shift to renewable resources and recycle as much of the scarce ones as is possible. What finite resources can we rely on for the coming decades? Most of us are aware that fossil fuel will get scarce and we may already be experiencing supply and demand volatility as it gets more expensive , to extract, both economically and environmentally. Concentrated deposits of phosphorus and potassium, the other two essential inputs for modern fertilisers are also said to be peaking and with the current global recession it is possible that other inputs may be scarce and expensive due to temporary constraints in the supply chains. Since the sun is the only source of renewable energy, real growth can only be achieved by enhancing photosynthesis. So how do we transition to sustainable growth? Modern soil science has revealed that our soils contain all the minerals needed to support centuries, even millennia of high production without need for inputs. In recognition of this breakthrough 2015 has been marked as the Year of the Soil by the UN. There is also a broad consensus that Climate Change can only be addressed by sequestering massive amounts of greenhouse gases out of the atmosphere, the most important being carbon dioxide CO2. Fortunately CO2 is a key input for photosynthesis and growth, so excess CO2 in the atmosphere can be seen as a valuable input- farmers just need to focus on getting the soil working properly. 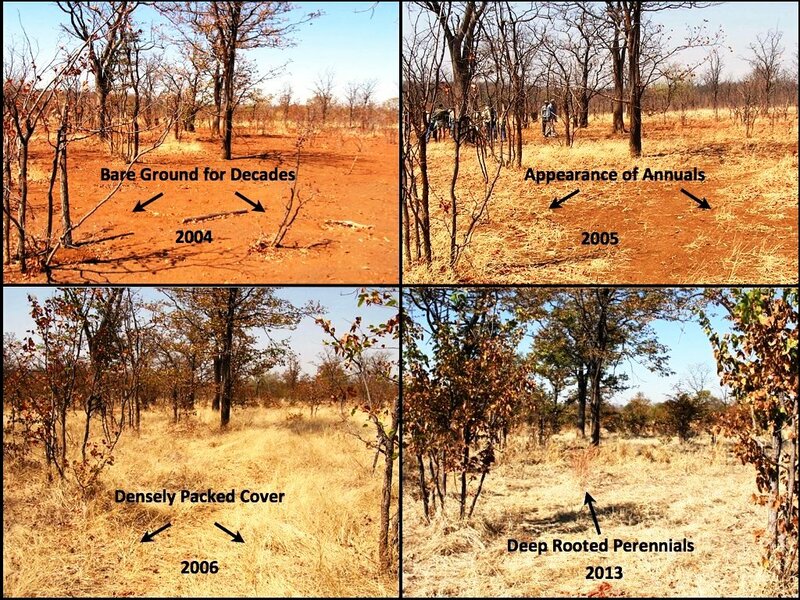 There is ample evidence that our environment across Africa is getting dryer- most of us are aware that rivers and streams, wetlands and underground reserves have dried significantly even in our own lifetime. The common belief is that this is due to decreasing rains or some say angry Gods! Rainfall records however often indicate little or no reduction in overall rainfall so what is really happening? The pattern indicates not only increasing droughts but also increasing floods. 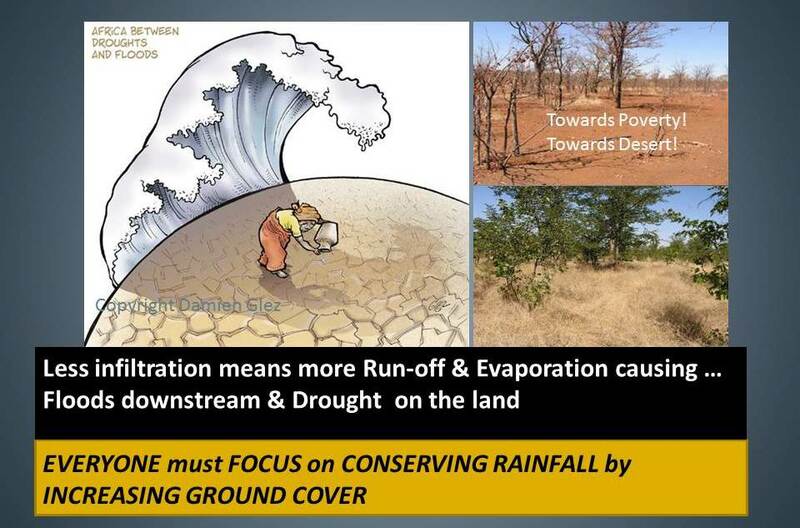 This means that even in a good year, abundant rainfall is not able to enter our soils, instead it runs off or evaporates leaving land dry. The ground is the safest place for the 10million liters of rain that falls on the average hectare in Zambia – once in the ground it can’t flood or evaporate, so really this is a national challenge- If all soil is managed properly (essentially covered) Zambia should have no more shortage of underground water, drying springs and wetlands, empty rivers and dams. Step 1 – STOP burning, ploughing, sedentary grazing and overuse of nitrogen and agro-chemicals. Step 2 grow more stuff together- cover crops, agro-forestry, restore trees, cycle manure. Fertility: The key to releasing this “free” nutrient flow is to rebuild a healthy biodiversity and soil cover- soils must be fed by recycling dead plant matter back into the soil. This can be achieved by changing management practices at very little cost- in fact good conservation is often much cheaper. Several effective tools have been developed to accelerate growth. 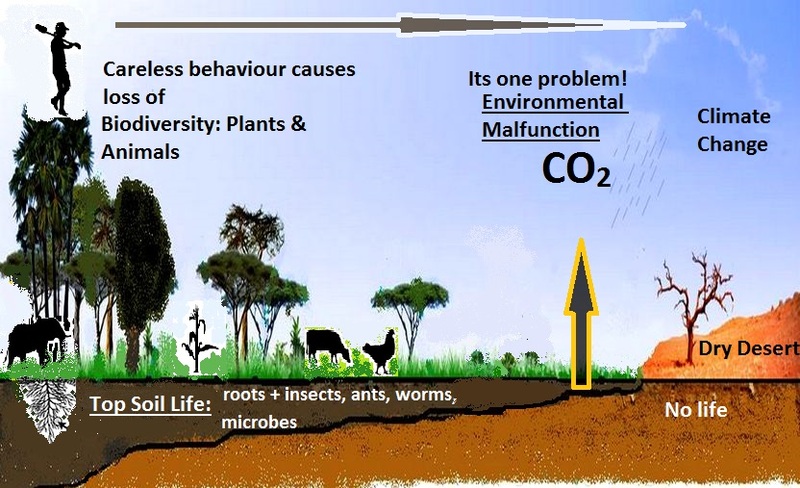 Universal principles start with less burning, tillage, and use of inorganic fertilisers and chemicals that poison the biology and increased ground cover, diversity, rotation and nutrient recycling. Grassroots Trust promotes four globally proven technologies that regenerate eco-systems whilst improving profitability. Holistic Management is a framework developed by the Savory Institute to ensure that decision- makers consider social, environmental and economic factors both short and long term thus avoiding un-intended consequences. Holistic Planned Grazing helps livestock owners revive natural/ traditional grazing patterns to improve pasture and eco-systems and reduce recycling of ticks, worms and parasites. HPG is being used by ranchers and pastoral communities to reverse environmental degradation and restore grasslands. Low input (regenerative) cropping enhances natural water cycles and nutrient flows to increase profitability and sustainability. 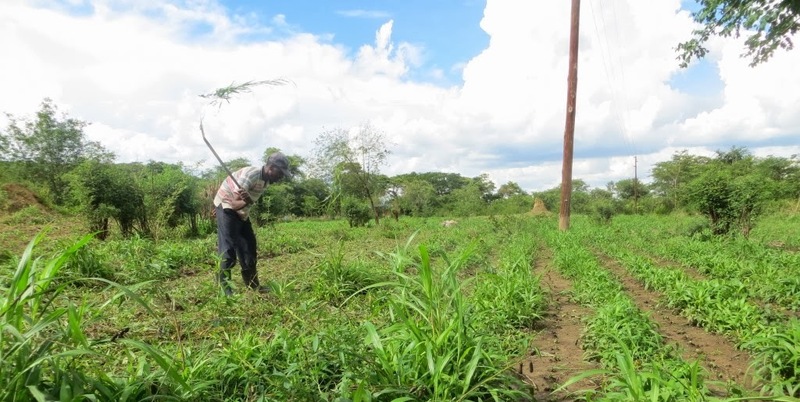 Grassroots Trust works with farmers and researchers around the world to develop integrated agriculture on the research/demo farm in Kafue where we achieve yields of over 7 tonnes/ ha equivalent with seed as the only input. Similar results have been achieved by contact farmers. Tree pruning is a traditional technology to regenerate trees from stumps and bushes by removal (pruning) of excess shoots and suckers. Most of the felled trees in Zambia are still alive and can be restored quickly and cheaply. 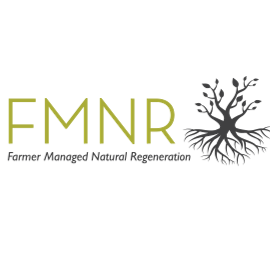 This approach is know as Farmer Managed Natural Regeneration and has helped countries like Niger Republic achieve massive regeneration of forests at very low cost and risk. The environment everywhere is desperate for local decision-making structures that includes and involves every land manager.